Ever Thought about Modern Wedding Venue in Croatia? Few days before Valentine’s Day we celebrated love in the restaurant “Sopravento”. Modern design and romantic atmosphere merge in this venue. Have you ever considered a modern venue for your wedding in Croatia? Read below why the newlyweds chose this modern wedding venue in Croatia to celebrate their marriage! The sea refreshes every venue and is often the cornerstone while choosing the wedding venue. “Sopravento” is located in a marina. The terrace overlooking yachts and sailboats adds a special charm to the venue. Ropes and wooden features prevail in the venue interior design, resembling a sailboat. The interior adds to the feeling of the sea ambient. Wide white translucent curtains, which resemble sails, cover the view of marina and provide privacy for the wedding. Greatly designed illumination highlights the interior colors. Wooden lamps, concealed spotlights and elongated fluorescent light bulbs supplement modern style of this wedding venue. Great interior design of this venue doesn’t require comprehensive additional decorations. The simple decoration was sufficient for the newlyweds to introduce their personality to this space. Orchids, gypsophilae and tulips enriched every table. Except for striking venue decoration, the newlyweds chose this restaurant because of great food also! Finger food welcomed the guests at the restaurant entrance. Guests enjoyed bacon and mozzarella canapes, prawn pâté with arugula, mashed potatoes with tuna and breadsticks, as well as bream tartar sauce in sparkling wine. Main dish consisted of roast steak with green vegetables with garlic and turkey breast filled with curd and Istrian bacon breaded in goat cheese with fresh Istrian malvasia. The celebration was accompanied by a great music, which was confirmed by the dance floor until the morning! The newlyweds sailed sopravento (upwind) into their marriage in this wedding venue. Flammeum is agency which organizes weddings in Croatia. This venue proved us that weddings have new dimension today. Weddings are spreading on modern venues and getting out of the classic venue frame. “Sopravento” fulfilled all romantic wedding venue expectations. 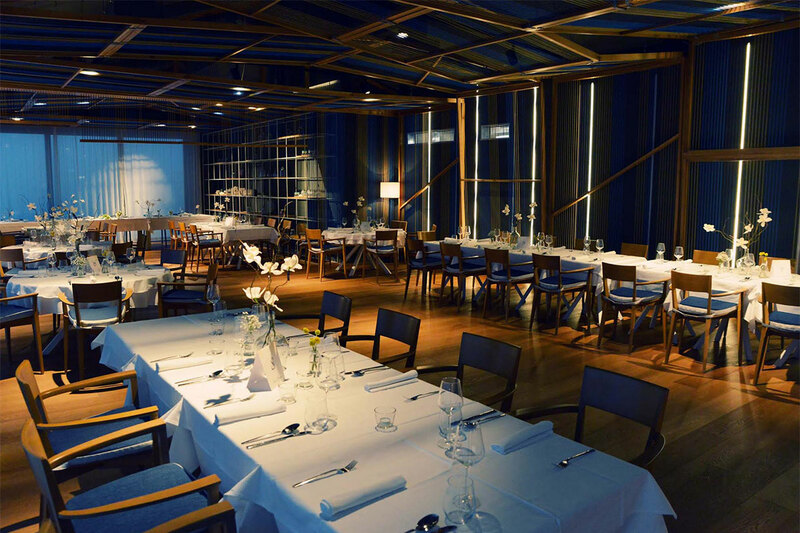 Flammeum can recommend this wedding venue to all newlyweds. Contact us if you wish to find out if this venue is suited for you. Previous: Why Hire a Wedding Planner? Next: Elopement – is it Simple as it Seems?